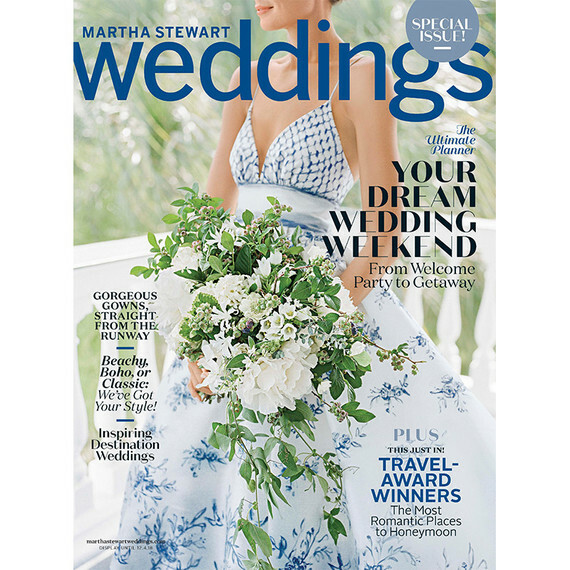 We had the privilege of working with so many wonderful couples in late 2017 to make their dreams come to life for their Spring 2018 weddings. Now that their wedding days have past, we wanted to share these unique and beautiful designs with you! Jacob proposed to Taylor with a ton of flowers, so they wanted to incorporate lots of florals in their wedding. Once the couple decided to host their wedding at Hotel Henry, we created Save the Dates featuring our custom Hotel Henry illustration by Alyson. Carrying the "flower party" theme into the invitations, we featured full color printing with gold foil lettering and details. We then tied the invites together with custom lined envelopes, a custom wax seal, and with gold calligraphy to complete the suite. We love when couples get creative with day-of items, so we were thrilled to print favor cards on a wildflower seeded paper that guests could take home and plant! 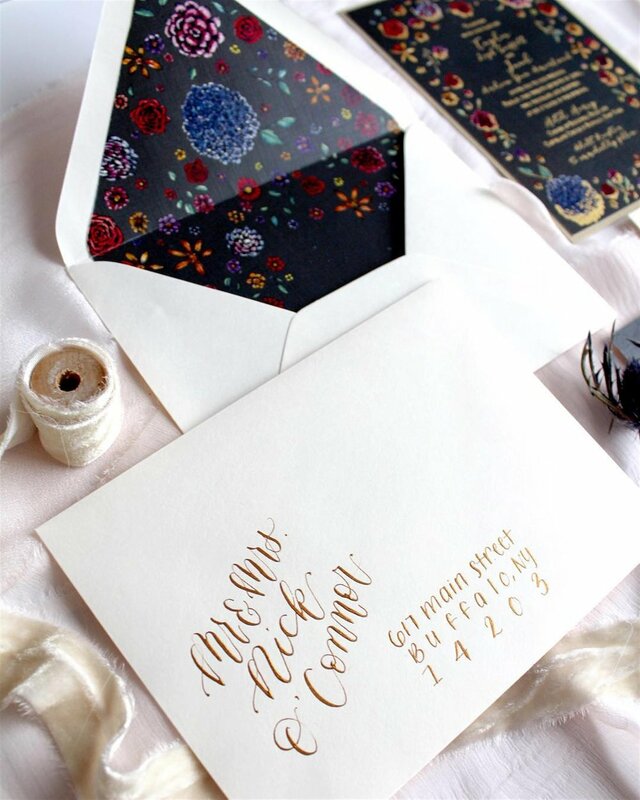 Hand calligraphy by Pretty Sugar Co.
Photo by Ashley Schaffert Laderer, Morning Glory. Megan and Nick came to us with their event planner, Sarah Pete Rizzi of Sincerely Pete Event Planning. Even thought they live in DC, they were super excited to support local vendors since they were getting married in Buffalo. For their invitations, we used a triple thick gray suede paper. They were printed digitally and we finished the invite with copper edge painting for an extra elegant look. For the RSVP card, we used our in-house Buffalo die-cut and a dark teal envelope with white printing. 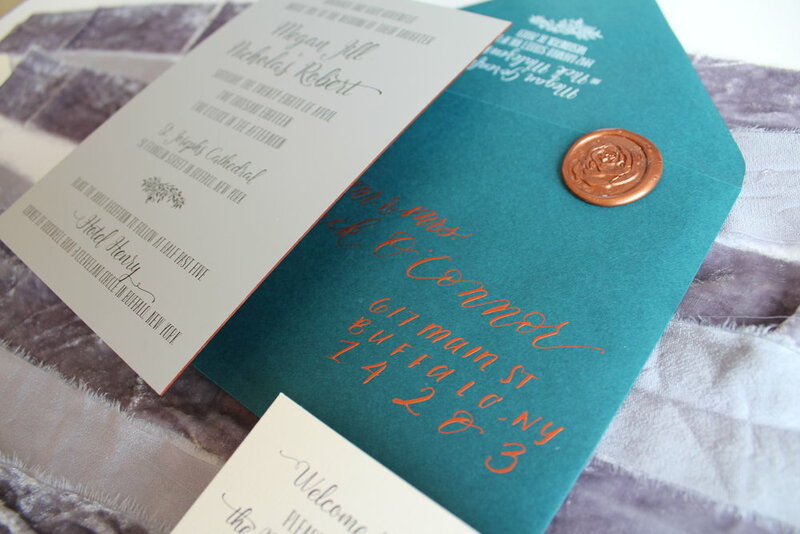 The outer envelope featured our custom Hotel Henry illustration and completed the suite with copper calligraphy and wax seal. We can't get over how amazing the color of Nick's jacket is and how well it paired with the invitation suite! We are so excited to announce that we are expanding to a new space! But don't worry, we're just moving across the hall in the Historic Market Arcade Building. This new space features more retail space, a full workroom which will hold one of our letterpresses, and provide more room for our staff to assemble and create. We will be releasing a new line of gifts (featuring our Buffalo and illustration designs) as well as carrying some fun new lines of paper products, cards, and planners. After our rebrand earlier this year, we are excited to incorporate our new colors and design elements in the space too. Check out our instagram to see progress photos and sneak peeks of the new space! We're currently in full reno-mode (but we’re still open!) and will be ready for our opening this Friday, September 14th. Come on out to Curtain Up and stop by our new space to celebrate with us. We can’t wait to share this new space with you soon! Well hello there! We're so excited to share our new blog with you here at RBL. We're dedicated to sharing wedding inspiration of all kinds. We'll share pros+cons, tips+tricks, project ideas, guides, and more- all to help every aspect of your wedding planning and day go smoothly. We'll feature sneak peeks of the beautiful work we're doing here at RBL, and maybe even a giveaway or two. We’re here to help you navigate a stress free wedding season and we’ve got answers to your questions! Comments and questions on our posts are definitely welcomed! We'll give you our professional opinion and even reach out to our network of incredible wedding vendors to provide resources for you every step of the way. We're thrilled for this next season at RBL and have many exciting announcements to share with you in the next few months. Join us by subscribing and follow along.